Pure water is the foundation on which pH is measured. Without any other constituents, pure water has a pH of exactly 7. Anything above that, and it's alkaline or base. Anything below, and it's acidic. Testing the pH of water is a relatively easy procedure using a test kit that can be bought at any health food, aquarium or pool supply stores. 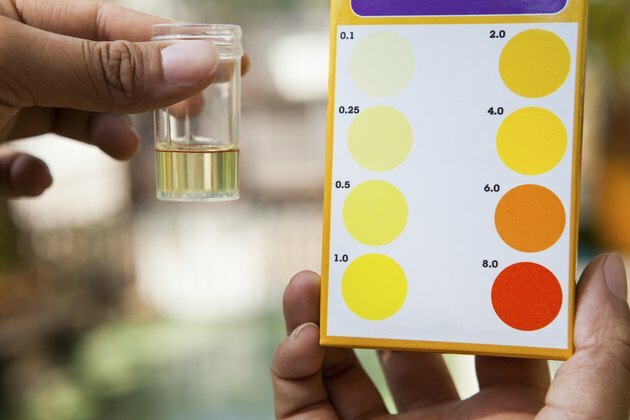 It contains a number of test strips that change color when wet and a chart to compare the color to get a reading on the water's pH level. Fill a clean glass with the water to be tested. Remove a test strip from the kit, being careful not to get it wet before placing it in the glass. Dip the pH test strip into the water for several seconds. Refer to the instructions for the pH test kit for exact time. There is no need to stir the strip. Remove the pH strip after the recommended time. Hold the test strip level and wait for the color indicator on the end of the strip to finish changing. Take a reading of the pH by comparing the color indicator on the test strip to the chart that came with the pH test kit. Different colors indicate different levels of pH. Dispose of the used test strip. It cannot be used again.